Secret Ingredient is one of Ashley's microgames in WarioWare: Smooth Moves. It reappears in WarioWare Gold, where it is one of Kat and Ana's microgames. The player has to grate a random object by moving the Wii Remote back and forth or dragging it with the stylus. In WarioWare Gold, the items range from a carrot to a meteor. 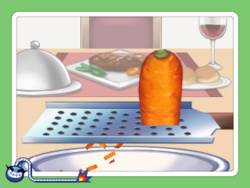 1st level difficulty: The player has to grate a small object. It can be a cellphone or an alarm clock. 2nd level difficulty: The player has to grate a medium object. It can be a fridge or a safe. 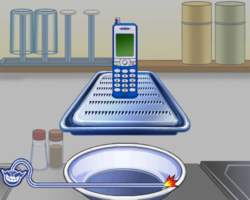 3rd level difficulty: The player has to grate a large object. It can be the Earth or a building. This page was last edited on February 18, 2019, at 16:37.